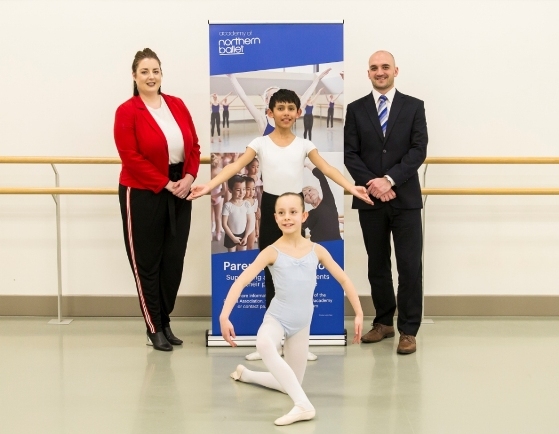 The curtain has gone up on a new Yorkshire charity partnership between business and the arts, designed to support the home-grown talent of youngsters involved in one of the UK’s most renowned ballet companies. Linley & Simpson, the independent estate agency with 11 branches across North and West Yorkshire, has danced to the aid of the Leeds-based Academy of Northern Ballet by funding a new app, launched by its Parents’ Association. The initiative will enable the Academy and its Parents’ Association to reach out in a novel way to all its students and their families directly, sharing news about upcoming events, opportunities for support, and ongoing activities. It will benefit the 800 students already registered – from tiny tots upwards – with over 60 of these training intensively several times a week to pursue careers as professional dancers. The app also breaks new ground by giving easy access to over 2,000 contacts based across Yorkshire including Kirklees, Skipton, Ilkley, Otley, Harrogate, Bradford, Leeds, Wetherby, Ripon, Beverley, York, Doncaster, Sheffield and further afield. Over and above this, Linley & Simpson is backing the charity by inviting it to become the latest partner of its Give Back community scheme that supports a raft of local charities and good causes. The initiative means that for every home sold or let through Linley & Simpson as a result of the new link-up, the agency will donate £100 to the Academy to support its future projects. The Academy of Northern Ballet is based in state-of-the art facilities in Leeds city centre, and provides world-class, non-residential dance training to people of all ages and abilities, whether their dream is to pursue a career as a professional dancer or they simply wish to dance for fun. Catherine Worthington, director of Academy Operations, said: “It’s fantastic that we have been able to strike a partnership with another organisation that shares Leeds as a home city and reaches out to people and communities across the Yorkshire region. Karen Willis, chair of the Academy of Northern Ballet Parents’ Association, said: “We are delighted to announce Linley & Simpson as one of the Academy of Northern Ballet’s sponsors. “As a Parents’ Association, we are constantly looking for new ways to support all students across the Academy by raising funds to help students facing challenging circumstances by assisting with bursaries for tuition, equipment and uniform, as well as providing fun events throughout the year for students and their families to join in with. Emily Wilkinson, who coordinates Linley & Simpson’s community and charity engagement projects, said: “Northern Ballet has been at the heart of our community for approaching 50 years and we are delighted to support the way it nurtures home-grown Yorkshire talent. Linley & Simpson specialises in both residential sales and lettings, and has a network of 11 interlinked branches covering Yorkshire’s most sought-after places to live – including Leeds city centre, Chapel Allerton, Roundhay, Horsforth, Harrogate, Ripon, Wetherby, York, Ilkley, Wakefield and Saltaire.